Jim Redder and his grandchildren, Abby and Ryan Mathiason, have won state titles in hand corn-picking contests. The Redders will host a corn-picking contest this fall at their farm northeast of Flandreau in Moody County. Ideally we’d be driving past thriving fields of healthy, ripening corn as we explore South Dakota roads in August, but this year drought has descended on our farms. Corn has been growing here for hundreds of years. Before Dakota Territory existed, before steel plows were invented. Before the Louisiana Purchase and before Columbus stepped foot in America. Today our corn crop is impressive. 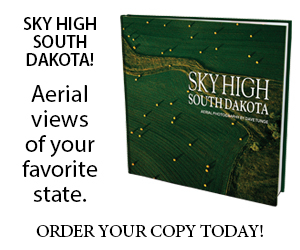 More than 12,500 South Dakota farmers have once again planted about 5.1 million acres. Last year, their efforts yielded a collective 850 million bushels. That contributed $2.6 billion to the state’s economy — over 5 percent of our total gross domestic product. Yields like that don’t happen by luck. My grandpa was a corn farmer but he probably never harvested more than 75 bushels per acre. 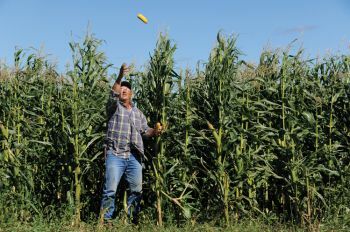 In 2015 the state average was 159, according to the South Dakota Corn Growers Association, and the highest yield was 288.62, credited to 38-year-old Joey Waldner of Huron Colony. “You know everything has to fall together just right to do that,” Waldner told one of our writers. The soft-spoken and modest farmer has been growing corn since he was a boy. He began by helping his father, the Hutterite colony’s farm manager. Joey says the key to a high yield is, “never let the corn have a bad day.” He and his men irrigate and fertilize and spray for bugs and weeds. My grandpa Bernie Hunhoff and his contemporaries tended their fields with equal care. Some would walk through the corn in the summer, cut the tallest stalk and then carry it in the pickup bed as a conversation piece, or maybe they’d take it to town for a “tallest corn stalk” contest. Today, due to modern genetics, stalks are almost all the same height; you don’t see a stray giant like the good old days. Furthermore, farmers don’t want their corn to grow really tall. They prefer more ears and less stalk. That may be why “tall stalk” competitions are a thing of the past. But make no mistake — drought or not, corn is still a cultural icon of South Dakota. The rains will fall again — hopefully in time to salvage this year’s crop — and records will be broken for yields per acre. We’ll discover new variations of how to enjoy corn on the cob at the county fairs and the Corn Palace Festival in Mitchell will celebrate farmers Aug. 23-27, rain or shine. For folks who love nostalgia and athleticism all wrapped in a husk, don’t miss the annual hand corn picking contest set for Oct. 1 at the Jim Redder farm near Flandreau. Men, women, youth and senior citizens all compete for a chance to go to the national meet. The event is free and lunch is available. Call (605) 997-3509 for more info on the contest. Rain or not, our fields are about to turn gold in South Dakota. Enjoy the celebration of our annual corn harvest.